The Holiday Inn’s Havana Bar and The Pacific Cigar Company recently hosted an exciting event that introduced Cuba’s most famous export and one that would most readily spring to mind when thinking of the Caribbean island and its capital city Havana – we are of course talking about cigars. Hocnial Diaz Valdez from Cuba, an expert in cigars and the classic way of rolling them with more than 12 years experience, was in town to demonstrate his fine art. 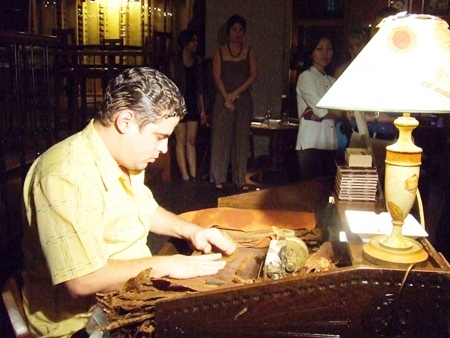 Hocnial Diaz Valdez demonstrates the fine art of cigar making. Joe Thawilvejjakul general manager of The Pacific Cigar Company and his team welcomed the throngs of guests who came along to the Holiday Inn to learn more about the fascinating world of cigars and who were able to sample some freshly rolled premium cigars along with an offering of accompanying malt whiskey, all at special prices. 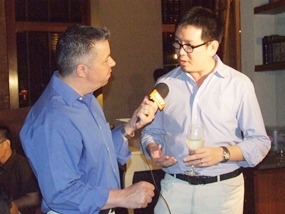 Joe Thawilvejjakul, right, from Pacific Cigar Company tells Pattaya Mail TV’s Paul Strachan all about the fascinating world of cigars. The Havana Bar and the Holiday Inn Pattaya host exciting and interesting events of this nature on a regular basis so look out for information of what’s on and when with details always listed here in the Pattaya Mail.